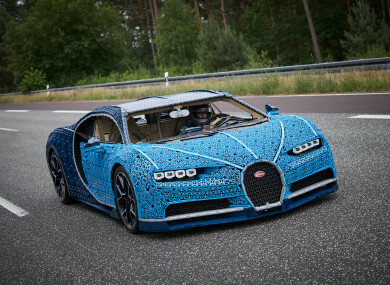 BACK IN JUNE of this year, Lego announced a Bugatti Chiron kit that allowed you to build a 1:8th scale replica of the mighty French machine out of 3,599 of the beloved construction bricks. Well, the Danish company has taken things up a notch and has created a 1:1 scale, fully-functioning Chiron model. Because, why not? Building it required the use of 339 types of Lego Technic elements and over 13,000 work hours of development and construction. Every single detail of the original car has been recreated in Lego Technic elements and the rear spoiler, speedometer, front and back-lights, detachable steering wheel and brake pedal are all fully functional. The model is the first large-scale movable construction developed using over 1,000,000 Lego Technic elements and powered exclusively using motors from the Lego Power Function platform. Packed with 2,304 motors and 4,032 Lego Technic gear wheels, the model weighs 1,500kg and the engine generates 5.3hp and an estimated 92Nm of torque. Testament that with Lego Technic you can build for real, this non-glued, fully-functional and self-propelled Lego Technic model can fit two passengers inside and can actually go! The car was taken to the same track where the real Bugatti Chiron was first tested – Ehra Lessien proving ground in Germany. Here, former racing car driver Andy Wallace put the model car through its paces and wowed the crowds with speeds of up to 20km/h – just a tad under the original Chiron’s 420km/h. Want to make sure you don’t miss out on anything going on in the world of motors? Like us on Facebook and follow us on Twitter for the latest updates. Email “This life-size Bugatti Chiron is made out of Lego Technic”. Feedback on “This life-size Bugatti Chiron is made out of Lego Technic”.